In doing research for Napoleon in America, I read several novels set in Texas in the mid-19th century. One of the authors of such works was Gustave Aimard, a French adventurer who wrote over 70 popular novels about the New World. Aimard was the illegitimate son of the wife of René Savary, Napoleon’s police minister and one of the characters in Napoleon in America. Through his Corsican father, Aimard may have been distantly related to Napoleon himself. 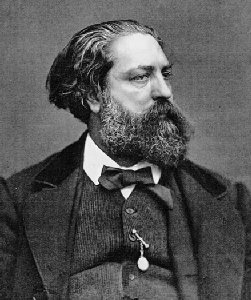 Gustave Aimard was born Olivier Aimard in Paris on September 13, 1818. Aimard’s mother, Marie-Charlotte-Félicité de Faudoas-Barbazan de Segnanville, a member of the old French aristocracy, was married to René Savary, the Duke of Rovigo, who had once been Napoleon’s Minister of Police. Savary had been living in exile from France since Napoleon’s 1815 defeat. Neither spouse was faithful. Félicité’s lover was Horace François Bastien Sébastiani de la Porta, a Corsican-born Napoleonic general and diplomat who was probably a distant relative of the Bonapartes. Sébastiani became a politician during the Bourbon Restoration and later served as French Minister of Foreign Affairs. He was most likely Gustave Aimard’s father. When Aimard was born, Félicité already had seven children, ranging in age from two to 16. She gave the baby to a family by the name of Gloux, and paid them to raise him. By the time he was 12, Aimard had fled to sea as a cabin boy aboard a merchant vessel. In 1835, at 17, he joined the French Navy. A few years later, he deserted during a stopover in South America (either in Mexico or Chile – sources differ). Gustave Aimard spent approximately a decade in the Americas. He visited Brazil, Argentina, Chile and Mexico. He hunted unsuccessfully for gold in California. He spent time as a trapper in New Mexico and Texas. He later claimed to have been adopted into a Comanche tribe. He also claimed to have visited Spain, Turkey and the Caucasus. By 1847, Aimard was back in France. That year his half-sister Fanny (Françoise, the Duchess of Choiseul-Praslin, Sébastiani’s daughter with his first wife) was brutally murdered by – it is thought – her husband, who committed suicide a week later. These events contributed to the start of the French Revolution of 1848, in which Aimard served with the garde mobile, a force of young working-class men who remained loyal to the Second Republic during the uprising in Paris in June. In the early 1850s, Aimard returned to North America as part of a mercenary expedition under Count Raousset-Boulbon. The force tried to secure the independence of Sonora from Mexico. After the expedition was defeated, Aimard went back to France. In August 1854, Gustave Aimard married Adèle Lucie Damoreau, a “lyrical artist.” They had at least one child, a daughter. Aimard started writing adventure stories based on his experiences. He produced novels at an impressive pace. He wrote at least 78 of them, many of which first appeared as newspaper serials. His books – early versions of the “Western” genre – were translated into English and other languages and became extremely popular. European readers had an appetite for tales about the New World. The books were criticized for their repetitiveness, as well as for a lack of realistic characters. Among Aimard’s most popular books were The Trappers of Arkansas (1858) and The Gypsies of the Sea (1865). His series about the Texas war of independence consisted of The Border Rifles (1861), The Freebooters (1861) and The White Scalper (1861). Gustave Aimard opened The Border Rifles with a lament on the plight of Native Americans. The immense virgin forests which once covered the soil of North America are more and more disappearing before the busy axes of the squatters and pioneers, whose insatiable activity removes the desert frontier further and further to the west…. Is this constant disafforesting and clearing of the American continent a misfortune? Certainly not: on the contrary, the progress which marches with a giant’s step, and tends, before a century, to transform the soil of the New World, possesses all our sympathy; still we cannot refrain from a feeling of pained commiseration for that unfortunate race which is brutally placed beyond the pale of the law, and pitilessly tracked in all directions; which is daily diminishing, and is fatally condemned soon to disappear from the earth whose immense territory it covered less than four centuries ago with innumerable tribes. During the Franco-Prussian War of 1870, Gustave Aimard fought in the Battle of Le Bourget, in which the French first retook, and then lost, a town just outside of Paris. Aimard wrote about the lost war, but his readership was not interested in something so close to home. Moreover, naturalism in literature was beginning to come into fashion. The fact Aimard had never been acknowledged by his biological family did not deter him from holding these pretensions. You can read many of Gustave Aimard’s books for free on the Internet Archive. Virgil L. Jones, “Gustave Aimard,” Southwest Review, Vol. 15, No. 4 (Summer, 1930), pp. 452-455. Truth, Vol. 13, No. 339 (London, June 28, 1883), p. 907. Gustave Aimard, The Border Rifles: A Tale of the Texan War, translated by Frederic Lascelles Wraxall (London, 1861), pp. 1-2. Daily News (London), June 27, 1883. Aimard was considered an illegitimate child because his biological parents were not married to each other. If the reader wants Indian fights, he can find them in every novel. If he is interested in highwaymen, pirates, spies, he will find an abundance of them.